So right now I am currently into alternating extremely healthy quinoa recipes with equally delightful unhealthy cookie ones. 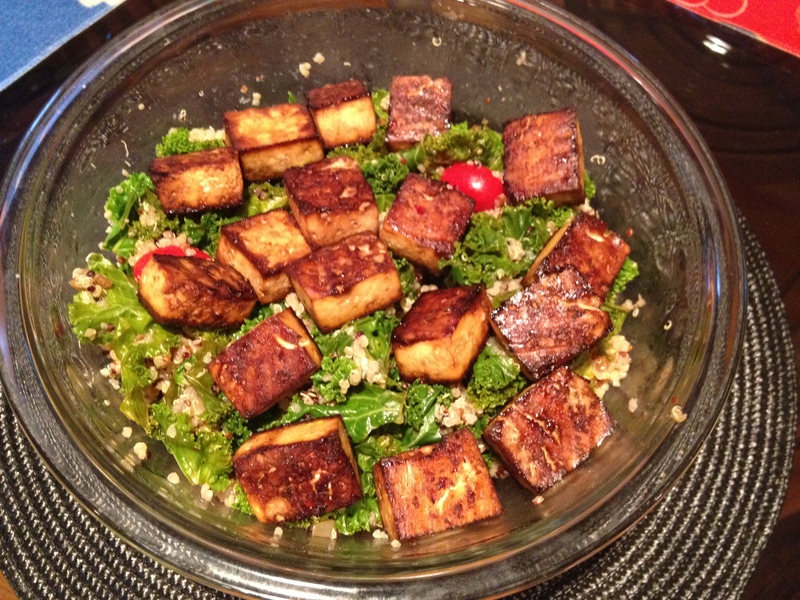 It is obviously now time for our next quinoa recipe which is made even more complete by the addition of kale and tofu. The tofu in this recipe is baked as opposed to sautéed in a pan, which brings out a different type of texture that might convert even the staunchest tofu hater. And you can use spinach instead of kale, but I really liked the kale in here. 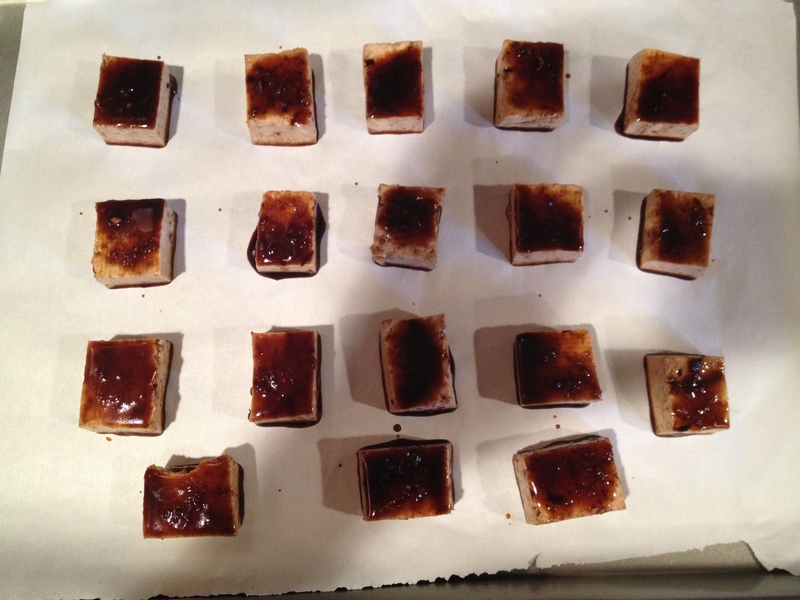 You can also experiment with the sauce that you bake the tofu in to give it different flavors. Overall this dish is quite versatile and very filling! 1/3 cup of Asian-type sauce – you can use Korean BBQ sauce or teriyaki sauce – I personally made my own mix by mixing up some low sodium soy sauce with a bit of Thai chili paste, and a pinch of garlic and ginger from tubes so it all mixed together quite well. I also added some lime to it. Feel free to experiment! 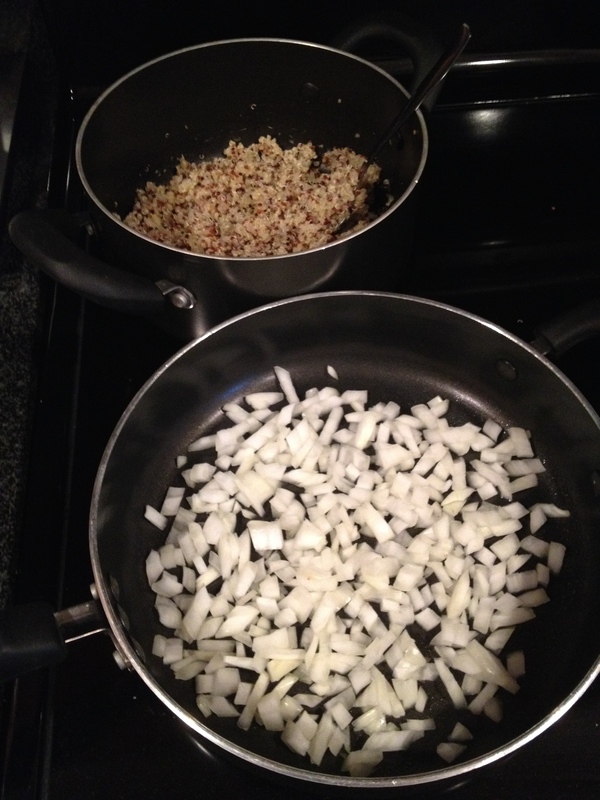 While the quinoa is cooking, prep your other ingredients by dicing the onion and tearing off the leaves of the kale. Also prepare your tofu by rinsing it and pressing it dry with paper towels. You have to go through a fair amount of paper towels to do this – put the block in between sheets of paper towels, put a heavy bowl on top and let it sit for a minute, then replace the paper towels and do this again several times. The drier the tofu is the better it will bake. Preheat the oven to 350 F / 180 C while you are doing this and mix up your sauce (or just pour some pre-made Asian sauce in a bowl). Lay a piece of aluminum foil over a baking sheet and grease it with cooking spray. Cut the tofu into small squares – about 15-20, and press each of these briefly in a paper towel too to get rid of any excessive moisture. Then dip both sides of the tofu in the sauce and put it on the baking sheet. When all the tofu slices are in rows on the baking sheet, if you have any leftover sauce just spoon little spoonfuls of it over each piece of tofu. Put it in the oven for about 30 minutes. I like to flip the slices over halfway through the baking time to ensure they cook evenly. While the tofu is cooking (or really wait till there are about 10 minutes left), heat a large saucepan to medium-high heat and add a bit of olive oil to coat the pan. Add the chopped onion and garlic and sauté for 4-5 minutes until the onion turns translucent. 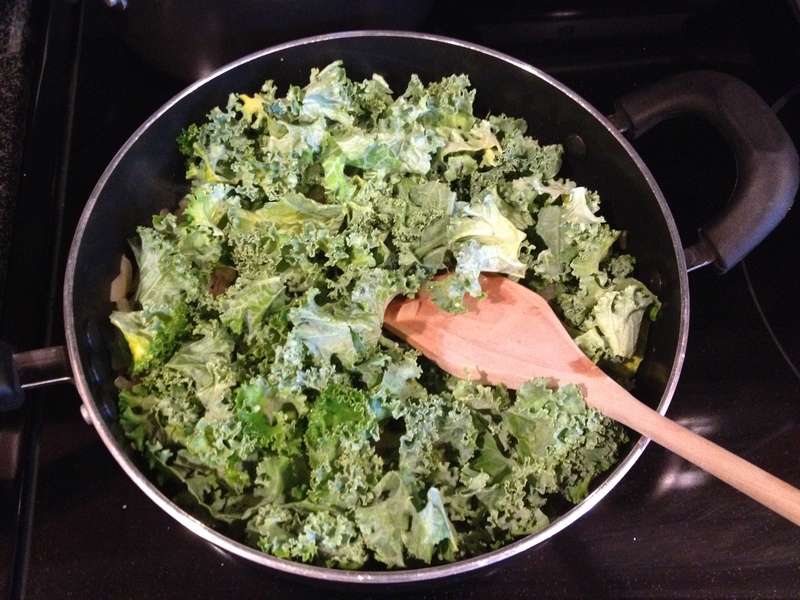 Then add your kale and a splash of water or two to prevent sticking and to help the kale cook down. 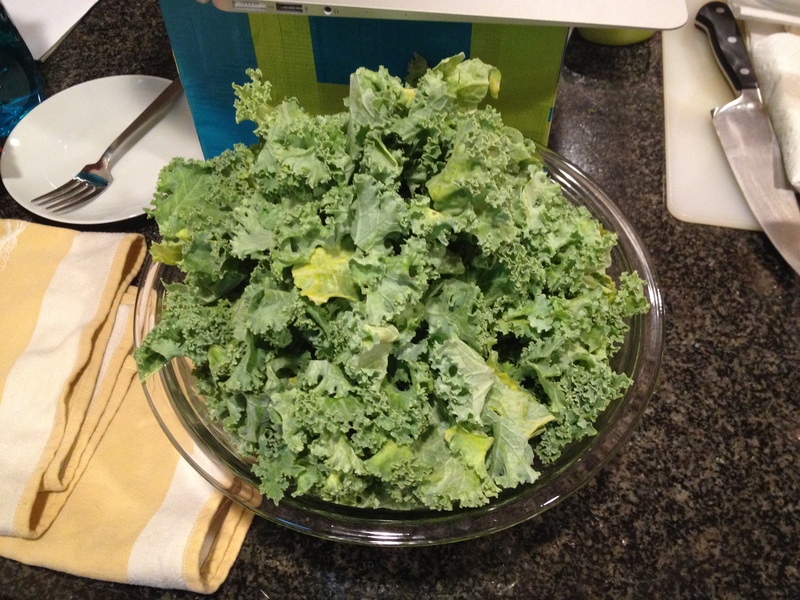 Kale doesn’t wilt as much as spinach but let it cook down for about 5 minutes. Once it’s not bright green in color anymore and is more tender, remove the mixture from the heat. 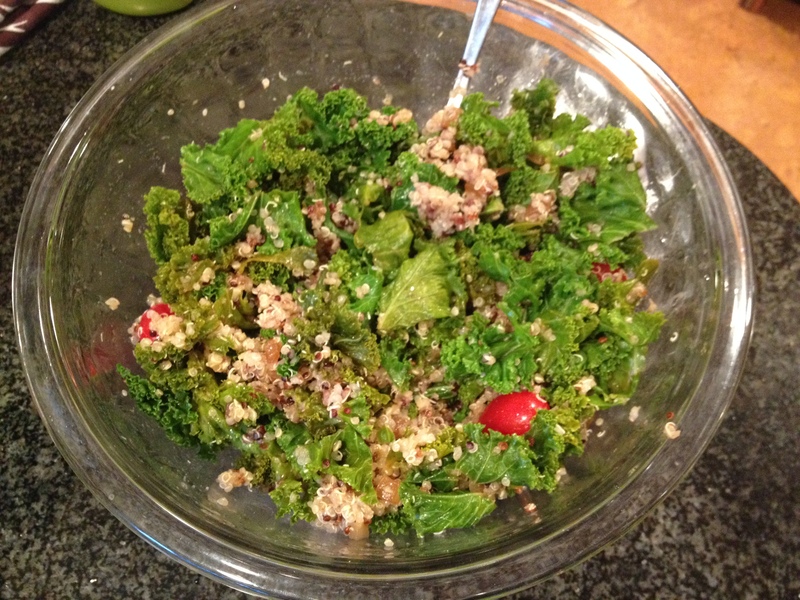 When you’re ready to put everything together, add the cooked quinoa to the kale and onions mixture in a big bowl. I added some grape tomatoes as well. When the tofu is done, layer it over the top of the mixture You can of course also plate it individually! Make no mistake about it, this is actually an incredibly filling meal. One big bowl fed three people and we were quite full. It’s full of protein and antioxidants and vitamins and all that good stuff. The kale won’t wilt as much as spinach, which I liked, and I love the texture of baked tofu – a bit crispy on the outside but still soft in the middle. If you do something like add chickpeas (which the original recipe called for and I’ve made it that way too), it will pack even more of a protein punch. You can add more things at the end too, like slices of pepper or cucumber. I just love the idea of a filling one bowl meal that is fairly summery and super healthy. Honestly you just feel really good eating this, and I think it’s good enough to convert non kale or non tofu lovers, so give it a shot!